biology of Adeno-associated virus (AAV). Our laboratory focuses on three different areas of research.The first is the biology of Adeno-associated virus (AAV). AAV is a human virus that is unique in a number of ways. It is the smallest virus (20 nm). It needs another virus from a different virus family (adenovirus or herpes) in order to replicate. It has a linear single stranded DNA genome, and it doesn’t cause any disease in animals or humans. In the past we have developed in vitro biochemical methods for studying the replication of AAV DNA and used genetic techniques to identify the role of the AAV proteins in transcription, viral assembly and DNA packaging and viral entry. In recent work we have developed a complete in vitro AAV DNA replication assay that we have used to identify the cellular enzymes that are necessary for viral DNA replication. 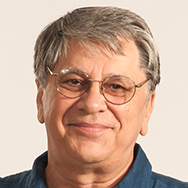 The reaction relies on the viral encoded Rep protein and the cellular enzymes polymerase δ, RFC, PCNA, and the MCM complex. We are currently using the in vitro reaction to determine how the Rep protein interacts with these proteins to replicate the viral DNA. 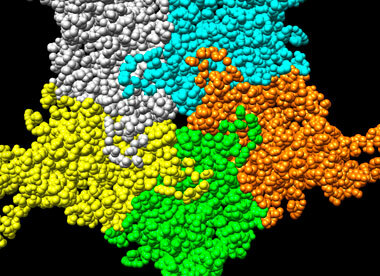 We have also mapped mutants on the surface of the virus capsid that are essential for viral entry or capsid assembly. We are using these mutants as well as X-ray crystallographic data (Fig. 1) to identify the receptor binding sites on the capsid surface and to understand how the virus travels to the nucleus and uncoats its DNA. Finally, we are also studying the assembly of the virus. In addition to the in vitro DNA replication reaction, we have developed an in vitro packaging reaction. 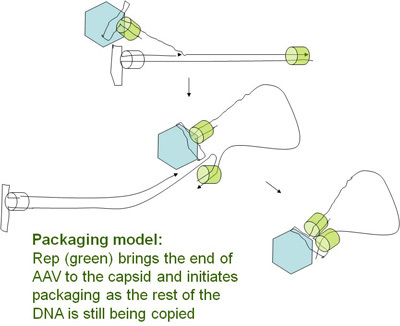 By putting these two reactions together, we hope to get a detailed understanding of how the virus couples DNA replication to capsid assembly (see Fig 2). The second area of study in our laboratory is gene therapy. We began our studies on AAV in order to learn how to use AAV to deliver genes to animal tissues. AAV has a number of features that currently make it the most widely used vector system in gene therapy. First, it has no pathogenicity and induces a very mild cytokine and immune response. In addition, the DNA persists for the lifetime of the animal, so only one application is necessary to cure a disease. AAV genomes also persist as extrachromosomal DNA elements; so the epigenetic effects that are common to integrating vectors, like shutoff of gene expression, are not seen with AAV vectors. Finally, because it does not integrate, there is little chance of insertional mutagenesis that might lead to tumors. Our laboratory developed the first recombinant AAV (rAAV) gene therapy vectors and over the years has helped to develop many of the practical techniques that are necessary to making gene therapy a reality. These include scalable (commercially viable) methods to grow the virus in large yield and quality control assays that are necessary for FDA approval of gene therapy pharmaceuticals. As part of this process we founded UF Powell Gene Therapy Center. We also founded the biotechnology company Applied Genetic Technologies Corp. (AGTC), which is currently engaged in clinical trials and preclinical research in four different diseases, alpha 1 antitrypsin (a pulmonary disease), and three eye diseases (rpe65 deficiency, achromatopsia and macular degeneration). We are also collaborating with other laboratories to develop rAAV therapies for Parkinson’s Disease and Alzheimer’s Disease. Finally, we are also developing the next generation of vectors. By mapping the capsid surface elements that are necessary for receptor binding and capsid entry, we are also identifying regions of the capsid that are available for insertion of new ligands that will target the capsid to specific tissues in the body. This will make it possible to design vectors that, when injected, home to the correct organ to provide a specific therapeutic effect. The third area of research our lab is pursuing is the development of animal models for neurobiology. rAAV can be used to quantitatively change the genotype of a limited region of the brain, such as the hippocampus (Fig. 3), which is involved in learning and memory, or the substantia nigra, which is involved in Parkinson Disease. Our laboratory is using rAAV to test the effect of overproducing a protein or knocking it down with siRNA when the gene is expressed in the hippocampus or the substantia nigra. This is a rapid way of testing the effects of genes on learning and memory (in the hippocampus) or on Parkinson Disease (in the substantia nigra). Our hope is that we will learn more about the mechanisms of neurodegeneration in Parkinson’s and Alzheimer’s Disease and identify targets for future genetic therapies.